Looking for a great outdoor banner system for crowd control? 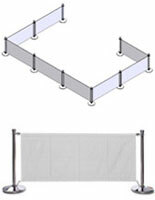 These sidewalk cafe barriers create temporary wall using stanchions and polyester fabric. 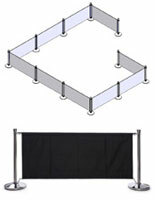 Moving and organizing customers is important when participating in any outside event or concert. 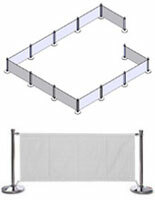 Restaurant fixtures like these are an ideal way to create a line and partition off seating areas at fairs and other events. 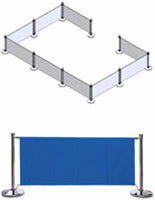 These sidewalk cafe barriers, also known as patio windbreaks, feature displays with one of four solid colors in a number of configurations ranging from 5 to 16 stanchions. 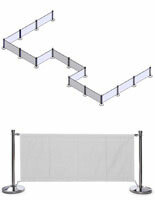 What makes fabric wind barricades great for use indoors and outside? 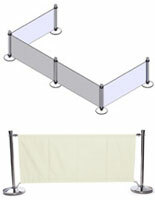 This type of sidewalk cafe barrier uses 600D polyester fabric sheets. 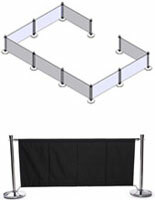 The material comes in four colors, red, blue, white, or black, and is both foldable and machine-washable. 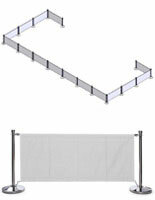 Crafted from the same fabric used in advertising umbrellas, these sheets will resist fading and shrinking. 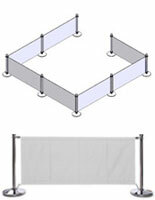 The stainless steel posts are 39.25" tall and weigh 22.5 lbs. for remaining stable in windy conditions. 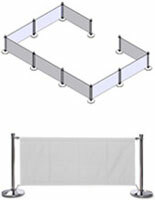 Each stand features a 4-way adapter for creating custom arrangements, from simple walls and squares to more complex layouts. 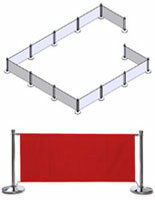 All posts feature a neutral silver finish to match any advertisement or company logo. These outdoor banner systems are easy to set up and disassemble, making them ideal for either permanent use on patios or temporary use at concerts or other events. 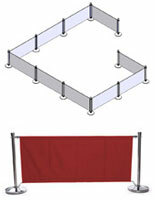 To install, simply attach the stanchion to the base, slide the sheet onto the rail and affix both top and bottom posts. 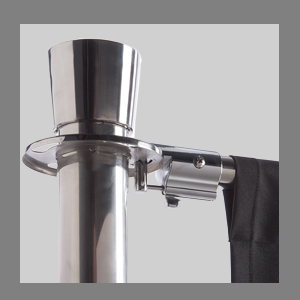 Each pole features a base with a small footprint at 14.5" in diameter and a rubber bottom that helps protect indoor surfaces. 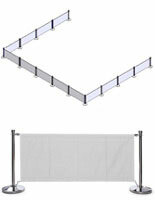 Each panel measures 6' long with a height of 31". 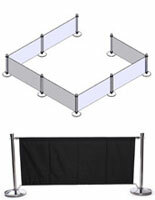 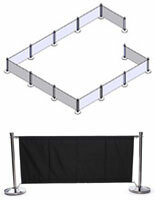 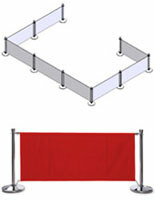 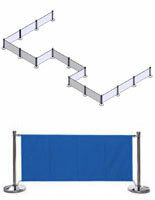 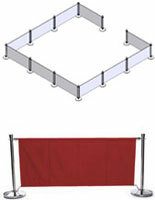 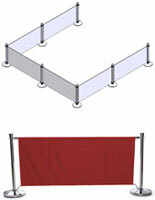 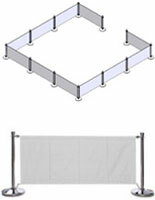 Barricade kits are available with as few as (4) panels or as many as (15). Each four piece set allows for a 25' display while the (15) panel models allow for 108' of signage. Outdoor banner systems like these are a great addition for any environment, inside or out. 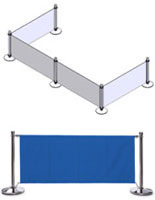 Used inside, restaurant stanchions for sale may be placed at counter lines to ensure that customers are waited on in the order of their arrival. 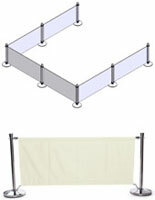 They are often found in department stores with central client service stations with the same purpose. Creating one line ensures that patrons will not be stuck in a slow line. Restaurant barriers are also an excellent way to create an outdoor atmosphere that clearly defines an eating or display area. 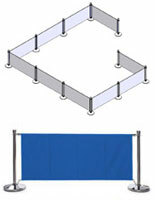 Again, they may be used to help with crowd control in an order line or they may be used to create a sit-down area where customers can dine. 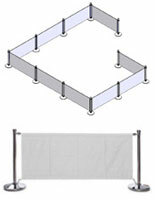 Order one of these patio systems with wholesale pricing and fast shipping on StanchionsDirect.com!